New FWCer on the east coast. So after years of spending 6-8 weekends a year surf fishing on the Carolina coast, in a 2005 F250, V8, CC, SB, with a raised camper shell and memory foam mattress, I decided to start the lookout for a FWC or ATC shell, last year. Well I finally found a local 2016 Hawk shell, silver spur, that I'm picking up tomorrow. I've gained a ton of info from this site in the last few days, so I decided to join. I've watched all of the videos for the eyebolts and read on here about larger backing plates. My model Ford has rounded sides between the bed sides and floor. The only flat spot in the front of the bed is right against the wall in the corner. I'm 1 1/2" from the front of the bed. I set the rear eyes 1" away from where the camper widens, so that should be good. I also bought a 1/4" rubber mat from an ag supply store. I'm going to use the stock turn buckles until I get a distance measurement, then replace with closed eye turn buckles, with jam nuts. The word is, the sand in the Carolinas is the deepest softest sand in the country. My truck does great, once I'm down to 20 psi in the tires. My concern is the twisting and bouncing through the wind ruts in the sand. These ruts cross the truck paths and can be 1 -1 1/2" deep and continuous for 50-100yds, like a washboard. They cause tremendous bounce. I would have liked a more symmetrical pull from front to back, but I felt the flat area would be a better option. Does this setup sound like it will be ok for the conditions I've described? I will check the tightness quite often. One other question. 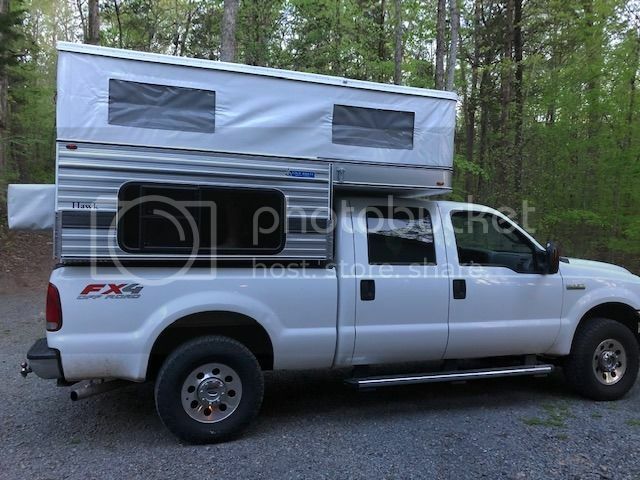 The current owner (2nd), says the camper does not have a battery. From what I can tell the isolator and 1 battery come standard now in the shell. I plan to purchase an AGM battery, but did the 2016 Hawk shells come standard with the isolator? Sorry for the long first post, but thanks for reading. Hi Piddlin, welcome to our group of benign crazies. It sounds like you found a very nice camper to go on the truck. Please post photos when you have the camper, we love photos. Hi Piddlin congrats. I am fairly certain I am the orginal owner of the Hawk. I have been to Freeman Park a few times with it as well as some OBX sand and can tell you whatever you want to know. Feel free to PM me. During my many hours searching this board, I had read your original "Frstnflt" post from 2016 and didn't relate the left side couch. I do believe it is the one. I have a few questions. I sent you a PM. 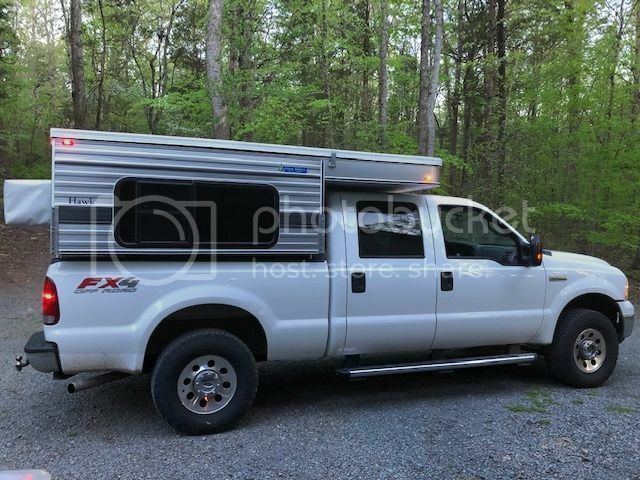 I had a 2003 F-250 with a similar bed when I bought my 2015 FWC Hawk. Sean, a FWC dealer in WI, simply drilled and mounted the eye bolts in the curved surface. The fender washers conformed to the round bed. I never had an issue. 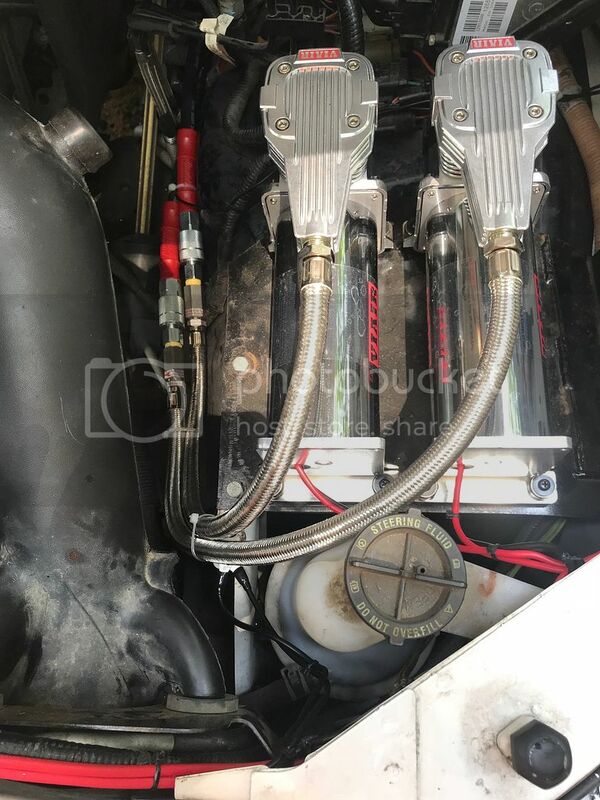 Sean has an older F-350 7.3 carrying his FWC Grandby, and he's done hundereds of installs so I wasn't worried in the least. I lived in the Raleigh area for 32+ years and visited the Outer Banks countless times. Do a search herein and you will find air down tire pressure recommendations. A set, even 2 sets, of Maxx Traxx is a must for the Outer Banks IMO. Unless you're going to rely on someone pulling you out of deep sand. I look at the Outer Banks deep sandy areas only one way...those who've been stuck and those who will be stuck. It's only a matter of time, especially in a heavy rig. Be sure to purchase an onboard air compressor. A must IMO for the Outer Banks and air down tires. I use an Extreme Aire Magnum portable air compressor. If you look at compressors, recovery time and time to inflate our big tires directly correlates to cost. I know there are airing up stations on OBX, but, I don't rely upon them. Can't help you with the battery question and wiring. Best to have the camper serial number and call the factory to find out exactly how the shell was upfitted when it was built. Be sure to ask the seller about any and all mods he did to the shell. Have fun and enjoy your camper! Edited by Advmoto18, 16 April 2019 - 01:39 PM. Thanks for the advice. I wish I had know about the curved areas being OK. If I have issues, I'll relocate. I'm good with airing down and inflating. My wife bought me the Staun deflators a few years ago, after I had been eyeballing them for awhile. I have twin 200 PSI Viair mounted compressors under the hood, with 3 gal tank underneath. I can take all 4 of my 295s from 20 psi to 55 psi in 14 minutes. 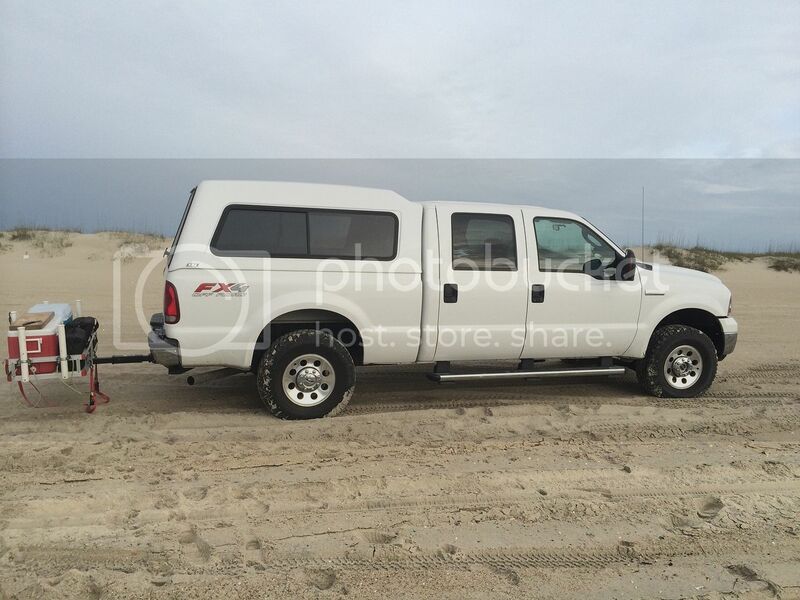 With the Hawk, I hope to have the ultimate surf fishing truck. Here is the before pic. I'll post an after pic, once the Hawk is mounted. Edited by Piddlin, 16 April 2019 - 03:24 PM. 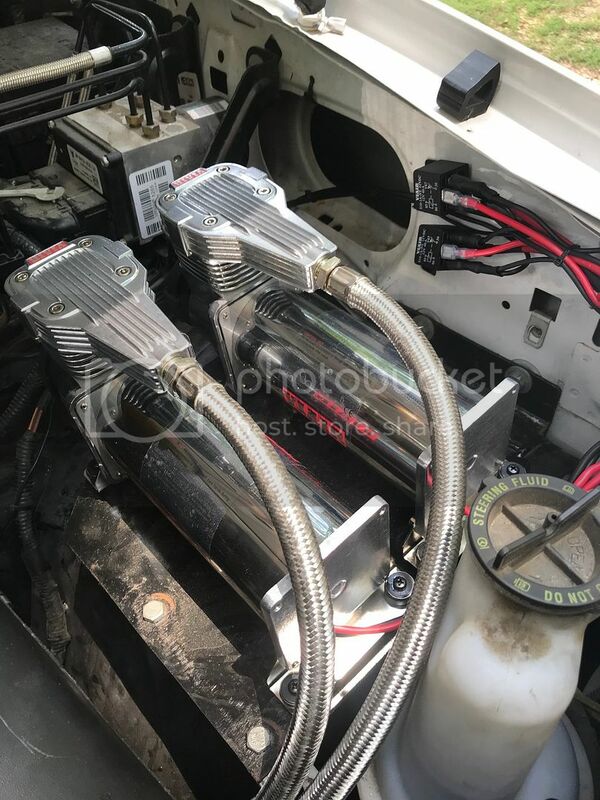 Sweet Viair system! I'm envious! Hope you have better luck with the Staun deflators. I was never quite satisfied. I now use a simple ARB deflator. I have to watch the psi carefully as I deflate. I’ve had mine about 3 years and they have been great. Screw all four in, wait for them to cut off and they are dead on 20lbs. Sorry yours didnt work so well. Beauty, fits like a glove !